A rabbits diet is 3 part. Hay being the most important part of their diet. Rabbits should always have access to fresh hay. Bunnies under 6 months of age should be fed alfalfa hay. 6 months and older should be fed timothy, orchard or oat hay. A lot of rabbits appreciate a variety, while some only like one kind. Green and veggies should be fed daily. You can find a list of rabbit approved greens/veggies here http://rabbit.org/suggested-vegetables-and-fruits-for-a-rabbit-diet/. The majority of their fresh food should be a leafy green. The approximate amount should be 1 packed cup of greens per 2lbs of rabbit. We also like to give a bit of non leafy vegetables with their salad. That should consist of no more than 1 tablespoon per 2 lbs of body weight. Rabbits love fruit, but it should never be more than 10% of the diet due to fruit being high in sugar. Pellets are a good source of vitamins and minerals. We do not recommend a pellet free diet unless a rabbit savvy vet advises otherwise. 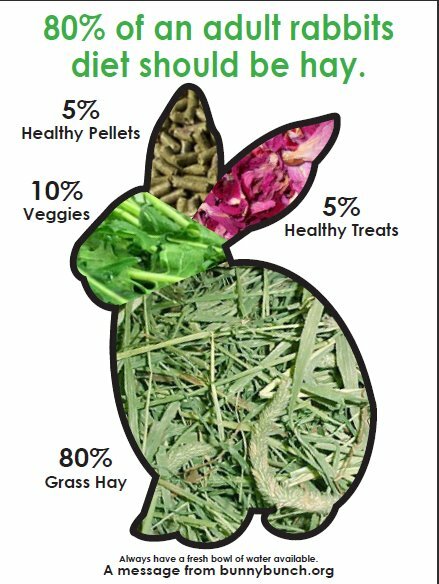 For rabbits under 6 months of age it is best to feed an unlimited amount of an alfalfa based pellets. Over 6 months of age a timothy based pellet is recommended. Please do not feed your rabbit a pellet with any mixed seeds, nuts or colored bits. We have found that rabbits much prefer a water bowl or crock over a water bottle. They will stay better hydrated if offered a bowl. Rabbits should always have access to fresh, clean water.